By exploring a sample of 16 of the closest protostars, thanks to the interferometric array of the Institute of millimetric radio astronomy (IRAM), an international team of astronomers, led by researchers from the Department of Astrophysics-AIM Laboratory of CEA IRFU, has just shown that a majority of disks where planets will be formed are born much smaller than expected. The size of these disks around young stars, currently being formed, could be limited by the influence of the magnetic field, the effects of which have so far been underestimated. These results are the subject of an highlight in the journal Astronomy & Astrophysics. What are the initial conditions for forming planets? Protostellar disks are disks of gas and dust that surround "protostars", stars that are forming, and in which planets will be later built. The first phases of the evolution of protoplanetary disks are still poorly understood because, even for those closest to us, their observation requires the ability to distinguish details below the arc second (the size of a coin seen from 4 kilometres away) through a telescope. Because of their low temperature and their embedded nature, these disks do not emit visible light but so-called "millimetre" radiation that can be observed by radio-telescopes. Their understanding is of paramount importance to better reconstruct the origin of our own solar system. As part of the IRAM large program called CALYPSO, researchers used observations from both the Plateau de Bure Interferometer (France) and the Pico Veleta 30-m telescope (Spain) to produce a complete set of observations from a sample of 16 of the youngest and closest protostars, to search for disks in the very early stages of their formation. The CALYPSO team analyzed in particular the dust thermal emission from the 16 proto-stars: "We decided to perform the analysis of the dust emission data because it is the most accurate data to study the spatial distribution of the disk structure. The angular resolution and sensitivity allow to probe distances less than 50 AU of the central star (1UA = the average Earth-Sun distance, about 150 million kilometers), a distance corresponding to the size of the most central part of the Solar System, similar to the distance from Pluto to the Sun. " explains Anaëlle Maury, the main author of the article. "We targeted the youngest known protostars, called "Class 0" objects, because these objects still retain the memory of the initial conditions of their formation and provide us with key information on the very first stages of disk formation" says Philippe André, principal investigator of the CALYPSO project. Left: Image of the spatial distribution of the millimeter emission of dust in the protostellar molecular cloud SVS 13, revealing the existence of a protoplanetary disk around two proto-stars in formation. Right: Intensity of the disc emission according to the distance from the center, showing that the disc contributes significantly only below 60 AU. The team was able to show that for 11 of the 16 protostars observed, the data clearly indicates the existence of young protoplanetary disks. But, of 11 of these potential disks, only 4 are detected with sizes greater than 60 AU. These unique observations suggest that, while most protostars have indications of protoplanetary disks, the vast majority of these disks (more than 75%) are much smaller than expected. 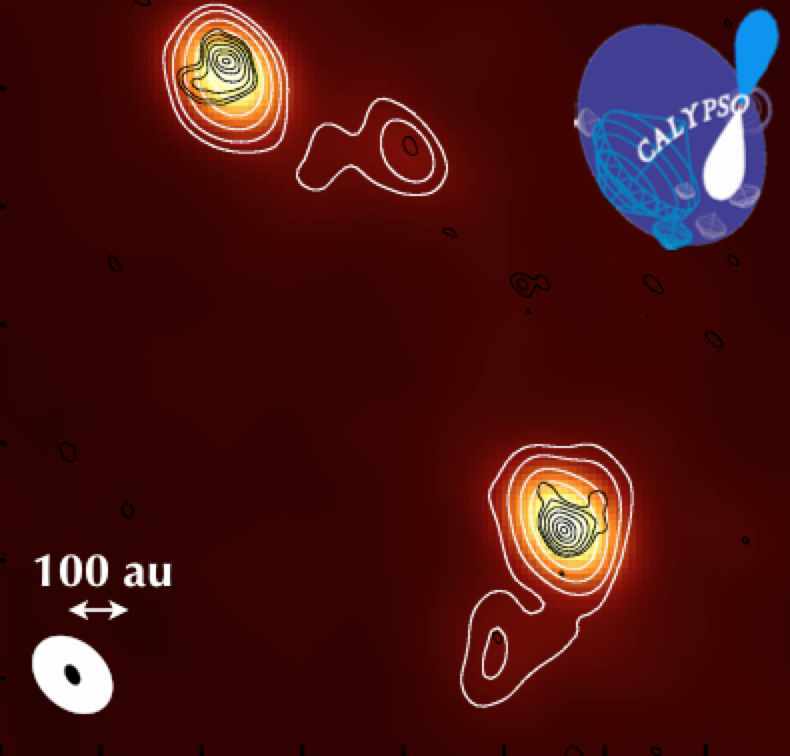 Thanks to additional measurements published by other researchers, the CALYPSO team was then able to show that, of 26 of the youngest protostars in our galaxy which were observed in a similar fashion, less than a third had disks with a radius greater than 60 AU. "Our results suggest that disk formation is concomitant with the formation phase of the protostar but could occur at much smaller scales than those predicted by hydrodynamic models of the collapse of protostellar cores, and that the effect of magnetic fields could be a key element in explaining these smaller disks discovered through our CALYPSO observations," says Anaëlle Maury. Researchers are now eager to confirm the properties of these potential disks by using complementary data that will allow them to understand in more detail how these primitive disks are formed. There are still many mysteries to be unveiled about the physics at work in the early stages of disk and planet formation! "Characterizing young protostellar disks with the CALYPSO IRAM-PdBI survey: large Class 0 disks are rare"